HARRISBURG, Pa. - March 4, 2014 - PRLog -- Harrisburg resident and celebrity photographer and painter Dionn Renee added another noted project to her portfolio. On Monday, the noted artist’s portrait of rapper Rick Ross was presented to the hip hop figure on BET’s 106 & Park, a popular program which features only the top hip hop artists. Renee was selected to paint the mural of the First Couple in the Harrisburg office of President Obama’s re-election campaign. 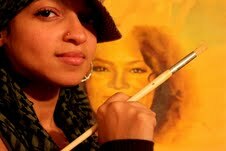 She is also known in celebrity circles for her paintings and photographs of such notable figures as Vice President Biden, Oprah Winfrey, poet laureate Maya Angelou (who has prominently displayed Renee’s portrait of her in her main office), Russell Simmons; TV and film figures (Tyra Banks, Tisha Campbell, Steve Harvey, Mehki Phifer, Chris Rock, Vanessa Williams, Davetta Sherwood, etc. ); and musical artists (including Eve, Jeremih, Meek Mill, Nicki Minaj, Trey Songz, and more).